Featured: Researchers from across the country and world gathered recently at The University of Texas Rio Grande Valley School of Medicine’s second annual Research Symposium, to discuss how they are addressing disparities in healthcare. State funding for a $70 million Health Affairs building at the University of Texas Rio Grande Valley in Edinburg is being sought by UT System leaders, who say the proposed facility will continue to develop highly-talented health care professionals for deep South Texas, according to Rep. Terry Canales, D-Edinburg. The planned 111,500 gross square foot UTRGV facility and new construction projects at eight other UT System campuses are part of UT academic institutions’ list of projects which were approved by regents during a Special Called Telephone Meeting, which was held in Austin on Thursday, September 6, 2018. In addition to the $70 million Health Affairs building, UT System regents also plan to ask the Texas Legislature for an additional $1o million for the UTRGV School of Medicine, and $4.4 million for a Cervical Dysplasia and Cancer Clinic, and Cancer Immunology Program. Also, UT System regents approved the creation of a School of Social Work and a stand-alone School of Nursing outside of the College of Health Affairs at UTRGV. UTRGV was created by the Texas Legislature in 2013 as a result of Senate Bill 24 by Sen. Juan “Chuy” Hinojosa, D-McAllen, and Rep. René Oliveira, D-Brownsville. Funding the $70 million Health Affairs building will require approval by the 86th Texas Legislature, which begins its five-month regular session at the Texas Capitol in Austin in mid-January 2019, for tuition revenue bond (TRB) funding. If approved for TRB funding by the Legislature, the $70 million Health Affairs building and new construction projects at eight other UT System campuses would be submitted to the UT System Board of Regents for addition to the Capital Improvement and design development approval. In an earlier and separate action, UTRGV officials in late August 2018 submitted its funding proposal, called the Legislative Appropriations Request (LAR), to the Governor’s Office of Budget, Planning & Policy (GOBPP), and to the Legislative Budget Board (LBB). The LAR for the UTRGV School of Medicine, which is a 77-page document, provides updated highlights of the UTRGV School of Medicine, including the reasons supporting the request for state financial support. The GOBPP and the LBB hold hearings on each agency’s strategic plan and LAR. Based on the hearings, the LBB and GOBPP separately prepare budget recommendations to be presented to the Legislature in January 2019 at the beginning of the legislative session. The Texas Legislature must approve the final state budget for all state agencies, including public universities, state boards, and commissions before September 1, 2019. The governor has veto power over individual budget items. According to its August 2018 Legislative Appropriations Request, UTRGV’s highest priority is the continuation of the $42 million previously appropriated in the 85th legislative session as start-up funding for the School of Medicine. These operating funds will be used to continue funding medical education for the full complement of medical students across all four years of medical education. Faculty salaries and benefits will continue to fund basic science and clinical teaching faculty required for Provisional Accreditation and to meet the curriculum requirements in all four years of medical school. Staff salaries and benefits will support the increase in the number of faculty and the demand for increased student support as the medical school reaches full enrollment of 205-220 medical students in 2019. The top Exceptional Item priority is additional funding necessary to achieve full accreditation by the LCME upon the graduation of the inaugural class in 2020. Special Item funding from the 84th Legislature set the stage for success and enabled the attainment of preliminary accreditation, the development of a rigorous medical education curriculum, the establishment of medical student services, and the hiring of faculty and staff; this important work continues. This request will allow the university to partially restore funding lost in the 2018-19 biennium and allow the hiring of clinical educators and faculty researchers, as well as provide staffing and operating resources to sustain the medical education program and accomplish other programmatic and institutional goals leading to the second phase of accreditation. The funding will also support years three and four of the School’s medical education, which focuses on clinical experiences and requires funding to support clinical partnerships and clinical faculty. Additional staff will support the increase in the number of faculty and demand for increased student services and advising as the medical school reaches full enrollment of 205-220 medical students in fiscal year 2020. The University of Texas Medical Branch at Galveston has agreed to transfer its Cervical Dysplasia and Cancer Stop Clinic operation in McAllen to UTRGV. The requested funds will allow UTRGV to build on the UTMB work by expanding cervical screening services for women in the Rio Grande Valley that provide unique educational opportunities for UTRGV graduate medical students. The research activities would investigate how cervical and related cancers affect Hispanic women in the Rio Grande Valley, in particular. Faculty and scientists would coordinate their efforts with departments of obstetrics and gynecology, human genetics, and microbiology and immunology. The requested funding will expand on the work already done by the ObGyn department; establishment of a residency program consisting of four residents; that number will increase to twenty residents over the next four years. The funding will also support recruitment of gynecology oncology faculty, and the establishment of human genetics and microbiology and immunology departments. Currently, the Department of Social Work is part of the College of Health Affairs and offers programs leading to a Bachelor of Social Work and a Master of Science in Social Work. The mission of the Department of Social Work is based on a commitment to prepare generalists and advanced professional social workers to meet the needs of a binational and multicultural community. The current educational emphasis is on social work practice with Latinas/Latinos considering multicultural competence, ethical practice, knowledge building, and social services that promote social and economic justice. As research and inter-professional opportunities increase, the challenge to improve social, mental health, systemic health, and ethical understanding of the unique culture of the community will also increase. A particular strength of UT Rio Grande Valley is the bicultural exposure for students, researchers, and educators, thus creating a prime location for future premier research, research funding, and knowledge application. The School of Social Work’s role in the community will become even more important as significant growth continues and evidence-based practice and inter-professional collaborative health care practice models continue to gain support in the work environment. As a Hispanic-serving higher education institution, UT Rio Grande Valley is positioned to deliver quality social work programs needed to serve the population of the surrounding disadvantaged and racial-minority communities. While planning has not yet begun and Board of Regents’ approval will be required, expanding the university’s presence across the entire Rio Grande Valley by creating doctoral programs in social work and establishing programs in partnership with healthcare facilities, school districts, geriatric facilities, primary care facilities, criminal justice facilities, and mental health facilities will be critical to continue to meet workforce demand and projected shortages. Additional graduate programs and graduate certificates will be requested to address the expanding scope of social work practice. Future undergraduate and graduate-level programs will allow students a broader range of quality education options with the ability to concentrate their degrees in alignment with direct practice with the additional unique challenges of the Latina/Latino population. A curricular focus on social work aligned with health care will also facilitate inter-professional programming within UT Rio Grande Valley’s new Division of Health Affairs. To ensure the Department of Social Work is on equal footing with other programs in the State of Texas and nationally, specialized leadership is critical in continuing to grow and elevate the program to the level needed to reach its potential. The quality of candidates needed to lead this program cannot be recruited and hired without elevating the position to a Dean-level designation. The independent School of Social Work designation will give a prospective Dean the flexibility and authority to move the program forward. No additional funding will be needed other than a change in compensation associated with a Dean-level designation. The School of Nursing (SON) plays a pivotal role in educating a substantial number of health care professionals in the Rio Grande Valley. The SON recently celebrated its 50th anniversary in the Rio Grande Valley and received recognition for its impact on education, students, patients, and the community. The SON’s future role in the community will be even more important as significant nursing workforce shortages continue and evidence-based practice and inter-professional collaborative health care practice models continue to gain support in the work environment. Expanding SON’s presence across the entire Rio Grande Valley, growing the R.N. to B.S.N. program, and establishing pipeline programs in partnership with school districts, primary care facilities, and community colleges will be critical in meeting the workforce shortages. Increased educational opportunities such as offering a Doctor of Nursing Practice, additional specialized M.S.N. programs, and specialized graduate certificate programs will address the expanding scope of nursing practice. To ensure the SON is on equal footing with other nursing programs in the State of Texas and nationally, excellent nursing leadership is critical. Elevating nursing to a stand-alone School outside the College of Health Affairs will enable UT Rio Grande Valley to recruit an outstanding nursing leader to serve as Dean. Other than an increase in the salary for the current Dean, the establishment of a stand-alone School of Nursing will have no additional costs. From advances in studying determinants of health, to public health initiatives to combat obesity and patient case studies, researchers from across the country and world gathered on Thursday, October 4, 2018 at The University of Texas Rio Grande Valley School of Medicine’s second annual Research Symposium to discuss how they are addressing disparities in healthcare. The symposium theme was “Health Disparities 2018: Closing the Gap,” and featured keynote speaker María Elena Bottazzi, Ph.D., Associate Dean of the National School of Tropical Medicine, and professor of Pediatrics and Molecular Virology and Microbiology at Baylor College of Medicine in Houston. 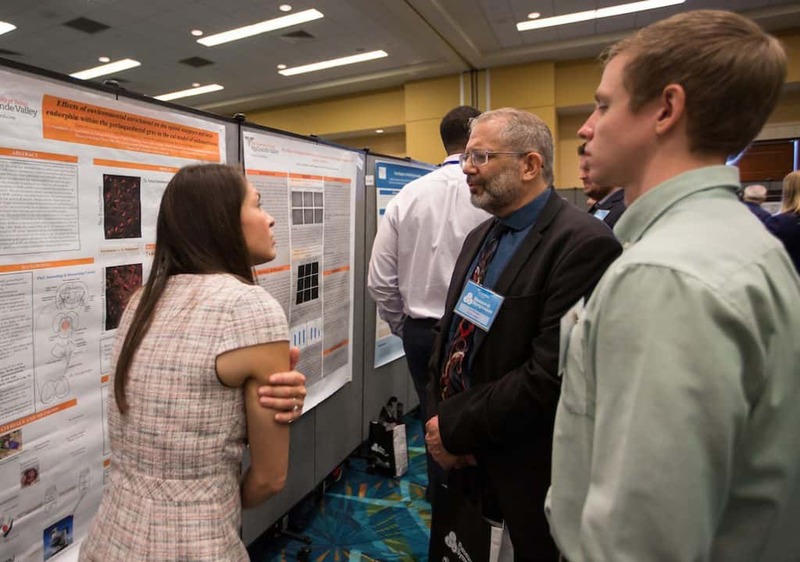 The symposium featured about 200 oral and poster presentations, including work done by UTRGV and School of Medicine faculty, post-docs, medical residents and medical students. About 400 participants – from high school students eager to learn more about scientific research to professional scientists – visited the McAllen Convention Center to showcase their research. The symposium also included presentations from various higher education institutions in Mexico. Symposium organizer Dr. Andrew Tsin, Associate Dean of Research at the UTRGV School of Medicine, said the theme was especially relevant, as much of the School of Medicine’s research focuses on reducing disparities in healthcare in the Rio Grande Valley and beyond. Among the research featured were patient case studies performed by UTRGV School of Medicine medical residents and students. Third-year medical student Alexandra Bulga said the case study she performed opened her eyes to the disparities in health care patients in the Rio Grande Valley experience. Bulga, who is excited to put into practice all they have learned the previous two years, also realizes socioeconomic factors can determine a patient’s care. “Medicine is taught in the perfect world, but that’s not the world we work in,” said Bulga, who presented on how a patient with type 2 diabetes and post-traumatic stress disorder had difficulty adhering to his treatment plan for diabetes because of his PTSD. Bulga won the award for Best Poster Presentation in the Medical Student category. Dr. Marita Sánchez-Sierra, a medical resident at the UTRGV Family Medicine Residency Program at Knapp Medical Center in Weslaco, and her team presented another case study in which they treated an uninsured 62-year-old woman for chest pains and found out through a pathology report that she had an advanced stage of gallbladder cancer. Sanchez-Sierra said the patient, an immigrant from Guatemala, had not seen a doctor in years. If she had received routine healthcare, the cancer could have been detected much sooner. McAllen Mayor Jim Darling greeted participants at the start of the symposium. In addition to providing the location for this year’s event, the City of McAllen also is working with UTRGV to establish the School of Medicine’s Cancer Immunology Research Institute. Darling said he participated in a clinical trial for the first polio vaccine when he was a child in Rochester, New York, and understands the importance of biomedical research. Expanding research opportunities here not only spurs economic development, he said, but will lead to innovations in treatment for diseases and improvement in the overall health of the community. The University of Texas Rio Grande Valley (UTRGV) was created by the Texas Legislature in 2013 as the first major public university of the 21st century in Texas. This transformative initiative provided the opportunity to expand educational opportunities in the Rio Grande Valley, including a new School of Medicine, and made it possible for residents of the region to benefit from the Permanent University Fund – a public endowment contributing support to the University of Texas System and other institutions. Jennifer L. Berghom contributed to this story. Rep. Terry Canales, D-Edinburg, represents House District 40 in Hidalgo County, which includes portions or all of Edinburg, Elsa, Faysville, La Blanca, Linn, Lópezville, McAllen, Pharr and Weslaco. He may be reached at his House District Office in Edinburg at (956) 383-0860 or at the Capitol at (512) 463-0426. For more on this and other Texas legislative news stories which affect the Rio Grande Valley metropolitan region, please log on to Titans of the Texas Legislature.